Come out for two days of fun with a LIVE Louisiana Crawfish boil, live music, arts and crafts, food, drinks, face painting and entertainment for all ages. This is fun for the whole family you do not want to miss.! There will be a kids dance contest with prizes and giveaways. Bring your chairs and stay all day! Friday kicks off at 6:00 PM til 11:00 PM. Saturday starts at 10:30 AM til 11:00 PM. A portion of proceeds benefit the Children's Miracle Network. Kids 12 and under get in free! Adult admission is $10. A. There is no designated parking area for the festival but there is plenty of parking close by on the street and in parking garages. Q. Can I bring my chair and cooler? Can I bring my dog? A. Yes, bring your chairs but no coolers are allowed. Yes, dogs are allowed. A. General admission gets you into the event. Anything for sale at the event is extra. Crawfish is not included with the entry fee. Kids 12 and under get in free. Q, Do you take credit cards at the event? A. Most all of our vendors only take cash. However, we have three ATM's on site for your convenience. Q. Can I get a refund or exchange? What if it rains? A. No refunds or exchanges. A little rain will not deter us from continuing this event. We will use our best judgement as far as safety concerns if there is inclement weather. A. Crawfish is sold by the pound for $10/pound. 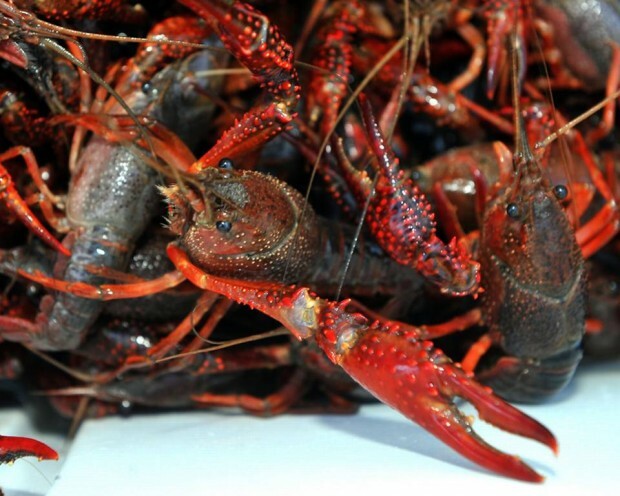 A small crawfish boil costs $10 an a large costs $20. We have many other vendors on site and they all try to keep their prices reasonable. Q. Can I leave and come back? A. Yes if you have purchased a wristband, you may leave and return as long as you have your wristband on. This only applies to the day you purchased a ticket for. All Sales Are Final. All Sales Are Final. All Sales Are Final. This ticket allows you one adult entry into the Frogtown Crawfish Festival. on Friday, June 21, 2019 only, This ticket is for entry into the event only. Crawfish is not included in this fee. You may re-enter the festival on the same day as long as you have your wristband on. You must bring your printed ticket to the gate to gain entry. No exceptions. All Sales Are Final. TIcket is for admission only and does not include crawfish. All Sales Are Final. All Sales Are Final.With your purchase of this ticket, you will receive one pound of cooked Louisiana crawfish only. If you wish to purchase more than 1 pound of crawfish, you will have to purchase adiditional tickets. No refunds. You must have your printed receipt to receive your order. If you do not wish to enter the event, go to the main gate and someone will bring your order to you. If you wish to enter the event, you must purchase a ticket at the gate.